If you think back to when you were a child, do you remember the feeling of seeing white or something ¨blank¨? More specifically, do you recall having the innate yearning to color and nicely take over the WHITE walls of your house with a crayon or marker? What about the incredible sensation of your art teacher handing you a WHITE ¨blank¨ sheet of paper. The notion of white/blank gives segway into freedom. It means you can release and express to your hearts content all you want within that space. All of this is synonymous with the opportunity to create. It's ironic to consider that with age and as we get older, people have a tendency to be afraid of a ¨blank¨ sheet of paper or canvas. Too much freedom? What deters us, as adults, to embrace the opportunity to create? 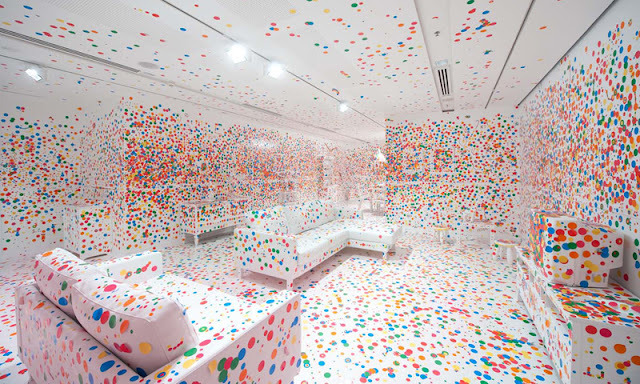 The Obliteration Room by Yayoi Kusama functions as a white canvas waiting to be invigorated by its visitors. The interactive project begins invites visitors to contribute to the decor with little colored dot stickers. Doesn't this look like fun?!? !